Do you need a security ground anchor to lock your motorcycle, quad-bike, ride-on lawnmower or other high value equipment to? If you do, you`ll certainly want one that won`t let you down! The units below are "concrete-in" ground anchors (sometimes called embedded ground anchors), however we also offer a range of tried and tested alternative types including; surface mount or bolt down ground anchors, wall anchor points and the innovative spirolock ground anchors. Why choose a concrete in ground anchor? Well as the name suggests, a concrete-in ground anchor is fitted into an excavated hole in the ground and concreted in place, making it one of the most secure types of motorcycle anchor available. They are also convenient, as with many of the model types available, the top of the ground anchor is flush with the surface of the ground, ...so there`s nothing to trip over! 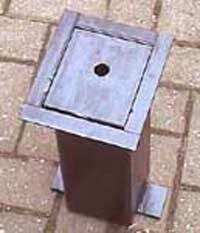 Manufactured from welded heavy gauge 120mm steel box section & plate, this self-draining unit is probably the most robust ground anchor in our range and is designed to concrete into to the ground so that the top of the unit is flush with the ground surface. The clever self-closing gravity assisted design ensures that when embedded in place, nothing protrudes above ground levelled unless the unit is in use. In operation, simply lift the anti debris plate and raise the anchor post via its "T" handle (designed to save you getting your hands dirty). Suitable for use with heavy duty chains up to a maximum diameter of approximately 50 mm. 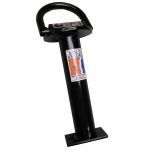 Manufactured from welded heavy gauge steel tube and plate, this unit comes as standard with a rugged powder coat paint finish and is designed to concrete into to the ground. 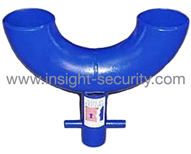 The self-draining design prevents the anchor tube filling with water and when the unit is correctly installed, the top of the tube should be level with the surrounding ground so that the unit does not present a trip hazard. In operation, the security chain passes simply and easily through the tube, thus forming the anchor point. The chain can then be wrapped around the item to be secured and the end links padlocked together or to the secured item. Suitable for heavy duty chains up to approx. 75 mm diameter. Manufactured from welded heavy gauge steel tube & plate, this unit comes as standard in a rugged powder coat paint finish and is designed to concrete into to the ground. The unit incorporates a heavy duty fold down top link which will accommodate the most heavy duty chain. In operation, the security chain passes simply and easily through the top link thus forming the anchor point. The chain can then be wrapped around the item to be secured and the end links padlocked together or to the secured item. Suitable for heavy duty chains up to approx. 19mm link diameter (90mm overall width). The price and performance of this versatile unit makes it one of our top sellers! Manufactured from welded heavy gauge 60mm steel box section & plate, this unit comes as standard in a red powder coat paint finish and is designed to concrete into to the ground. 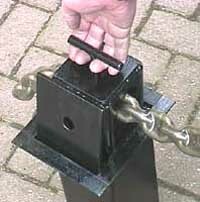 The self-draining design incorporates a rotating heavy duty top link (25mm shackle thickness). In operation, the security chain passes simply and easily through the rotating top link thus forming the anchor point. The chain can then be wrapped around the item to be secured and the end links padlocked together or to the secured item. Suitable for heavy duty chains up to approx. 50 mm diameter.